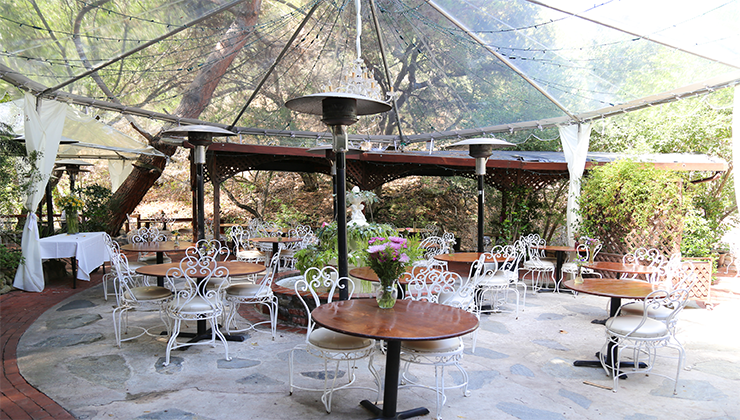 The Bride’s Guide to Affordable Wedding Venues in Los Angeles (+ wedding costs). 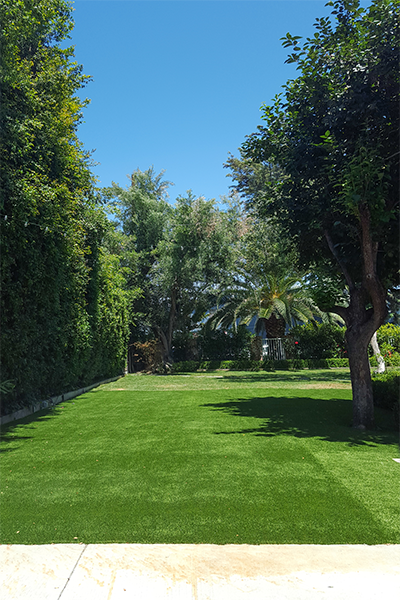 Looking for wedding venues in Los Angeles (especially "affordable" ones) is quite a daunting process because there are so many variables involved. How do I know? 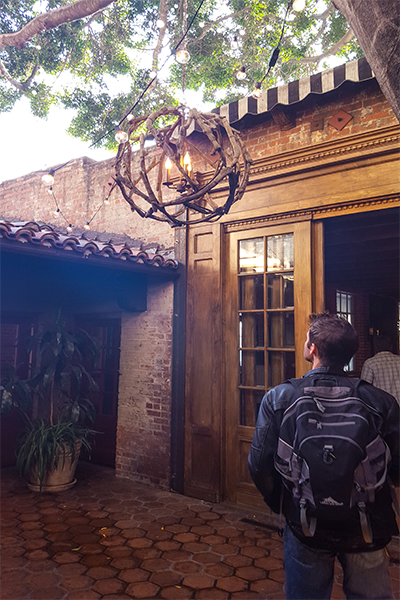 After getting engaged in late July, I jumped on the wedding train and made a mad rush to decide on a local Los Angeles wedding venue. The process was overwhelming. 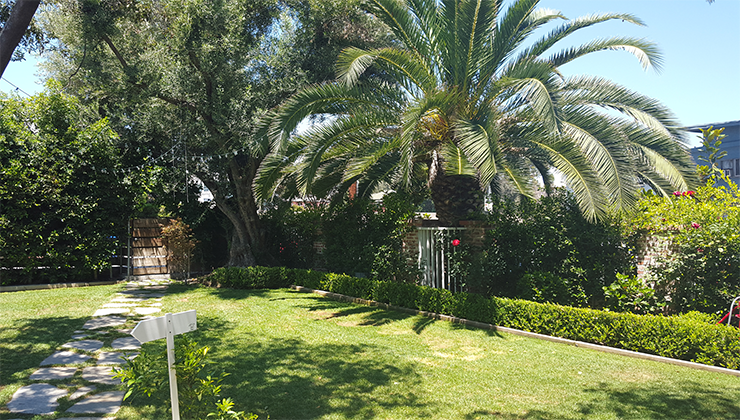 As I began to do more research online, I noticed that there were a lot of beautiful venues outside L.A. County (many about an hour away), but I wanted something sort of close, so when relatives and guests arrived, they wouldn’t have to drive too far out of town or from LAX. Everyone was kept saying, “Have it wherever you want, it’s your big day!” but when I started figuring out costs for out-of-town wedding venues, they mostly ended up turning up to cost about the same. So, you have to prioritize. For me, the top factors for picking my wedding venue came down to location, price, value and how it fit into the overall theme of my wedding. This bride-to-be wanted the most bang for her buck and it had to just look great and feel right, too. Of course, then you have to find out if the venue you like is actually available. My fiancé and I learned the hard way. 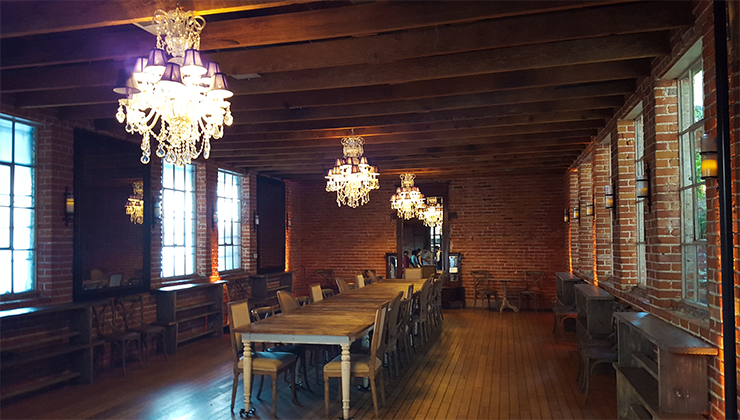 We took about 2 months to scout locations, and once we finally found our “dream” spot, the lady in charge of our venue gave it to someone else because they technically contracted it 24 hours before us – even though they had already drafted an invoice for us. You DO NOT want this to happen to you. My advice is to be as clear as possible when communicating with head honcho of your potential wedding venue. Call them, be specific, and even try asking for a soft hold. Find out how many days you have to make your decision before your contract is up because, as I’ve discovered, it’s a bride-eat-bride world out there! Anyway, hundreds of emails and dozens of wedding venue tours later, my guy and I finally "locked it down," and now I can pass along my findings to you! Listed below, I’ve wrangled up some wedding venues, most of which have historical value since I’m planning on having a Great Gatsby-themed wedding. I may be leaving some great ones out, but these are the one's we've visted based on our needs. Some of the wedding spots I picked out are just downright beautiful, but most importantly, they were the most affordable and in my opinion (of course, some were still above our budget) have great value for what you are getting. It mainly comes down to the venue/ceremony fees and the catering that will make the biggest dent in you and your fiancé’s bank account, so pay close attention to those two costs and remember, when all this planning becomes stressful and overwhelming, take a deep breath, walk away from the computer, kiss your fiancé and remember the whole point of why you’re getting married in the first place: LOVE. At the end of the day, if you think you can afford the venue, make sure you go a see it – you never know what you’re going to fall in love with! The James Oviatt building was once the second tallest building in Downtown Los Angeles. James Oviatt, a haberdasher for the rich and famous, resided in the penthouse with his wife at the top of his building completed in 1928. 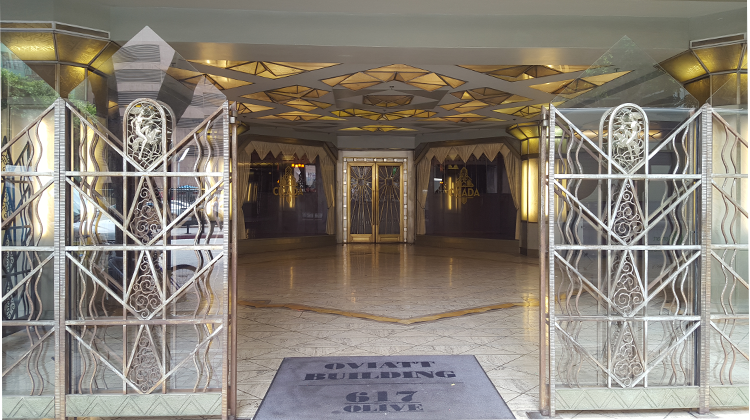 The Oviatt Penhouse’s style is Art Deco and many of the interior and exterior embellishments are adorned with Lalique glass. 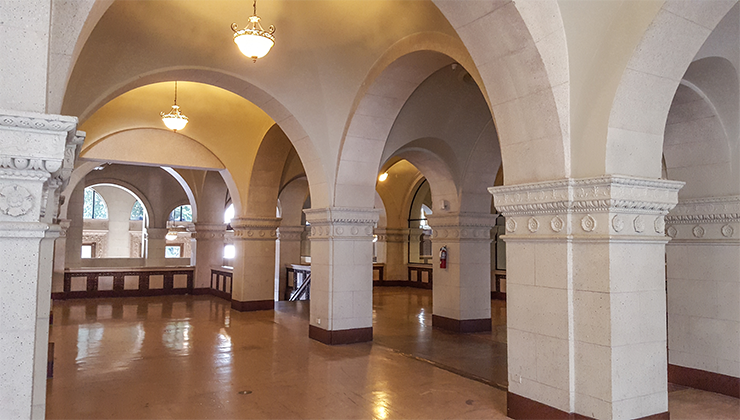 If an Art Deco, Hollywood Glam or Great-Gatsby themed wedding is your style, then you won’t want to miss an informational tour of the Oviatt Penthouse. The television show Mad Men named the Oviatt Penthouse as one of their favorite places to film at, F.Y.I. 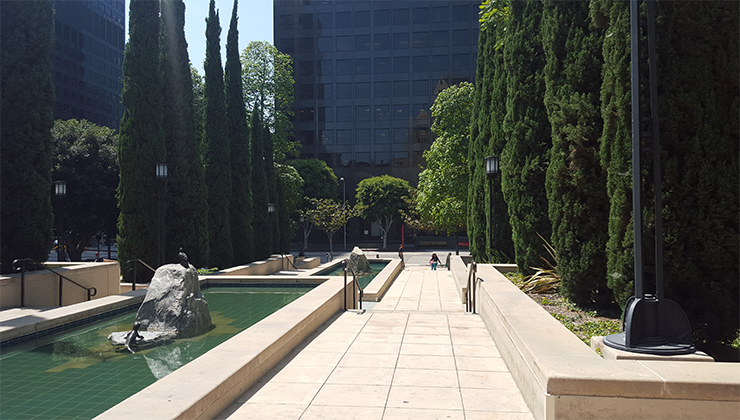 The ceremony and reception is held outside, and the Downtown Los Angeles cityscape will be beautifully lit up in the background for all of your wedding attendees. 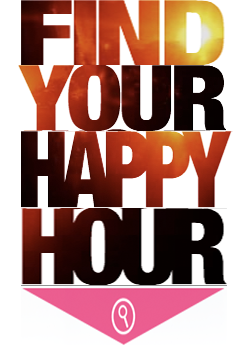 The venue fee is $3,800 for Sundays, $5,800 for Saturdays and $250/hour Mondays – Fridays. They usually offer a winter special, which can save you bucko bucks. 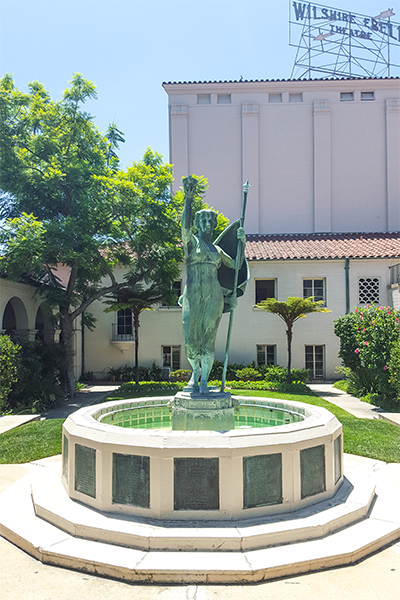 The Ebell of Los Angeles was originally a woman’s club that was founded in 1894 and today, it donates more than $150,000 annually to Los Angeles charities benefitting women. 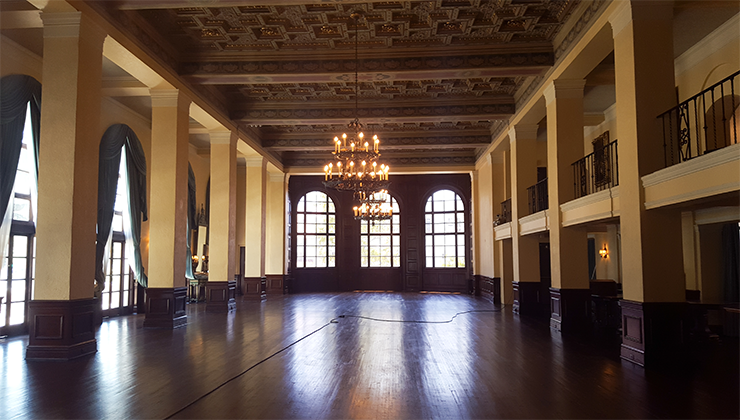 The 75,000 square foot building is Italian Renaissance-style and even includes the 1270 seat Wilshire Ebell Theatre. You have different rental location options for holding you wedding there: Lounge and Art Salon with Green Room ($5,000 for Saturday, $3,000 Sun-Fri), Garden and Dining Room ($4,000 for Saturday, $2000 Sun-Fri) or Exclusive First Floor with 2 Green Rooms ($9,000 for Saturday, $5,000 Sun-Fri). 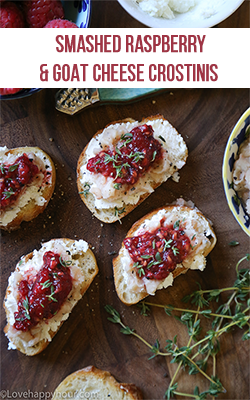 In-house catering options start at $100/pp (not including alchohol). 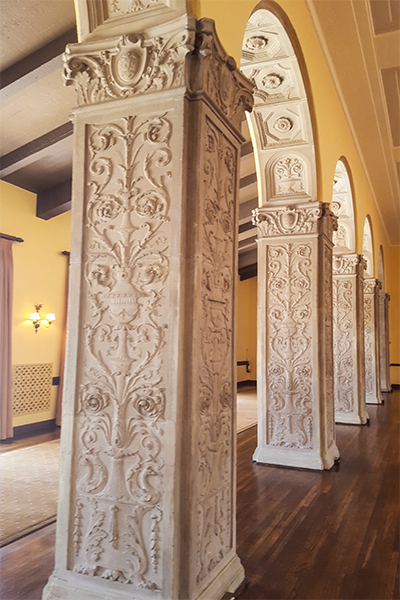 If you do book the Ebell or take a tour, ask for Michael Vogt - he’s the best. 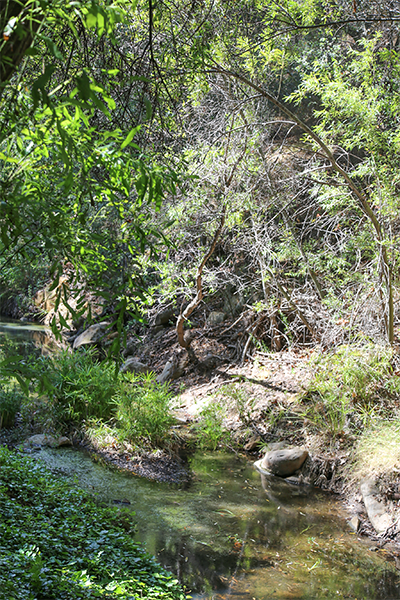 The Inn of the Seventh Ray was about a 45+ minute drive from West Hollywood, but when you start to enter Topanga Canyon, I realized why the location was worth the drive. The creekside restaurant is very romantic and sort of reminded me the old Tavern on the Green (pre-remodel) in Central Park, NYC. 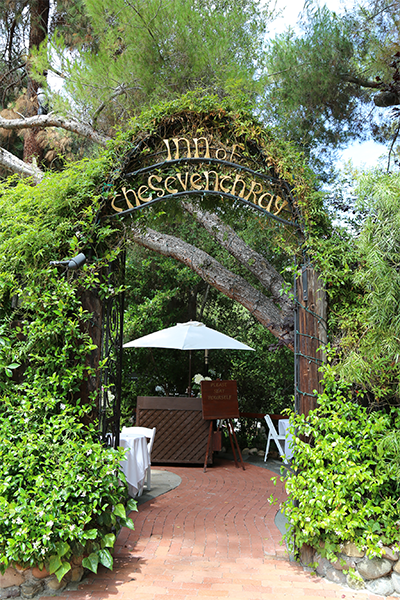 My fiancé and I visited the Inn at the Seventh Ray on a weekday afternoon, which was a pretty slow and perfect time to soak up the serene ambiance. 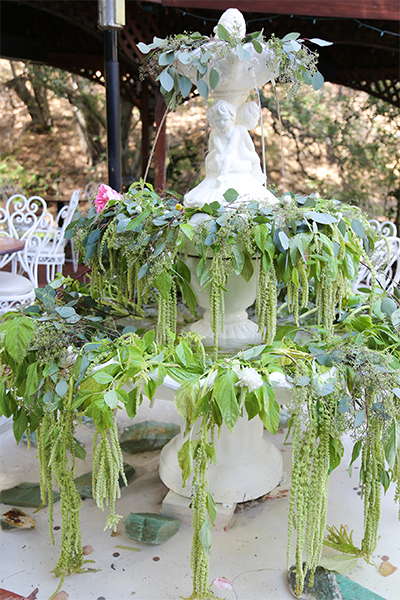 The beautiful fountain there is draped with fresh flowers and definitely stands out as the focal point. We also liked that out of town guests could stay in Malibu and Uber it pretty quickly to the venue. I recently found out that my neighbor celebrated their anniversary there and really loved it. For a wedding of 100 people, you are looking at around $17,000 and that includes venue fee, on site coordinator, food, beer and wine, valet parking and a wedding cake - that's for a Saturday night, too. Not bad. 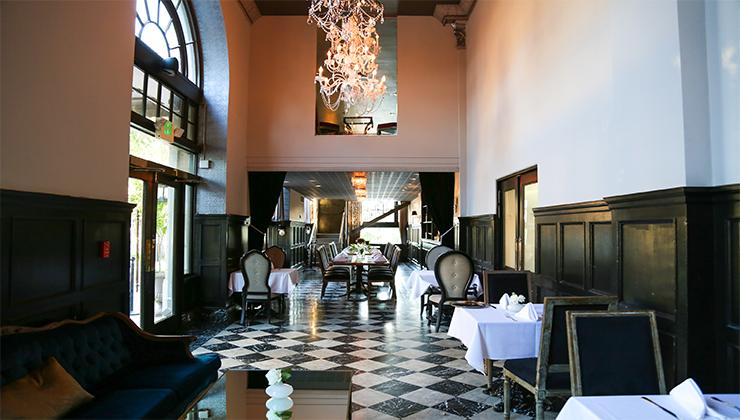 Another great Gatsby-themed recommendation for an L.A. wedding would be The Culver Hotel. 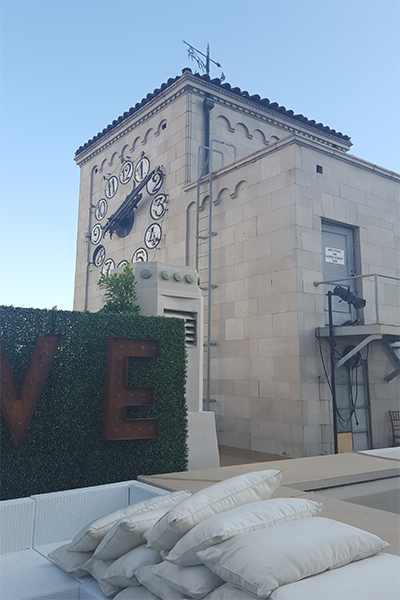 The swanky, brick boutique hotel based in Downtown Culver City still does a darn good job at embracing that Roaring 20s feel. 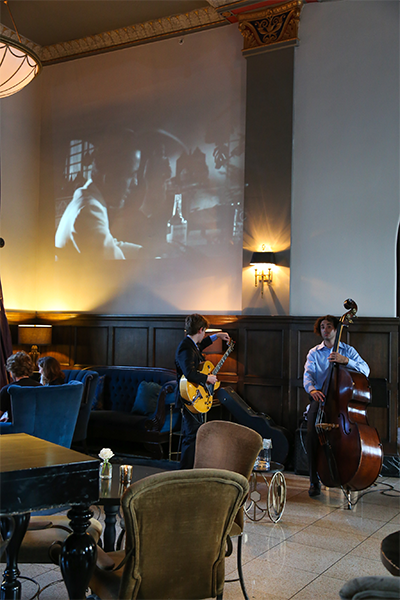 On select nights of the week, live jazz plays in the grand lobby and you can watch the movieCasablanca in the background while you sip on a dry martini. 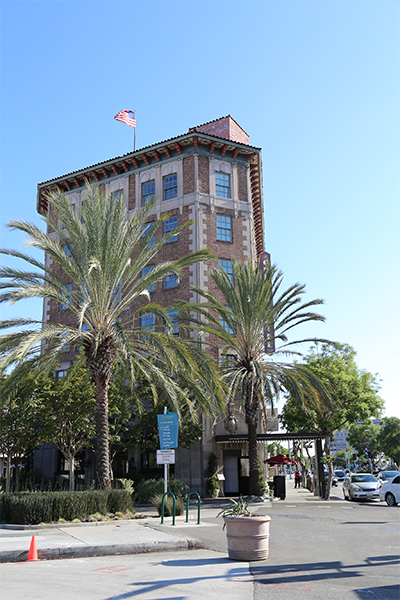 My fiancé and I liked the Culver Hotel even more for the convenience aspect; hotel guests are blocks away from plenty of local restaurant and bar options, including the ArcLight Cinema. 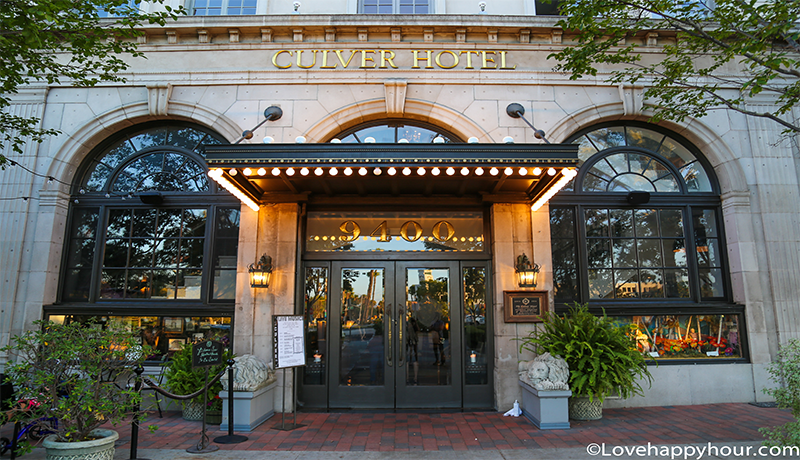 Fun fact: the Culver Hotel was rumored to house the original cast of The Wizard of Oz during its production. 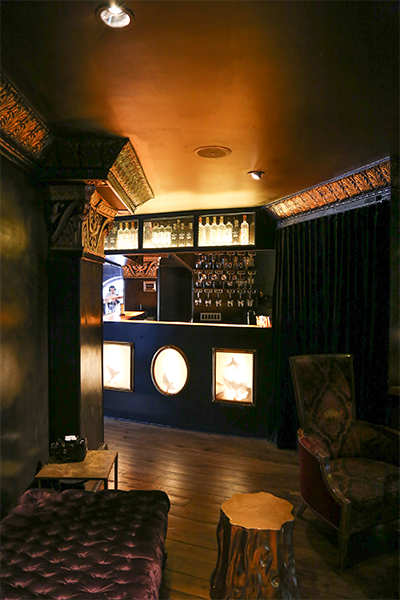 During the weekdays, there’s a great happy hour on the patio, but my favorite spot inside is the speakeasy-style upstairs lounge equipped with velvet chase lounges and other vintage furnishings. Catering costs for a reception run $150 - $250/pp and you can save a whopping $8k for the food and beverage minimum if you opt out of a Saturday wedding date. My friend, who’s in catering, suggested this hidden Hollywood gem. The Lombardi House reminded me of something out of the movie The Notebook. 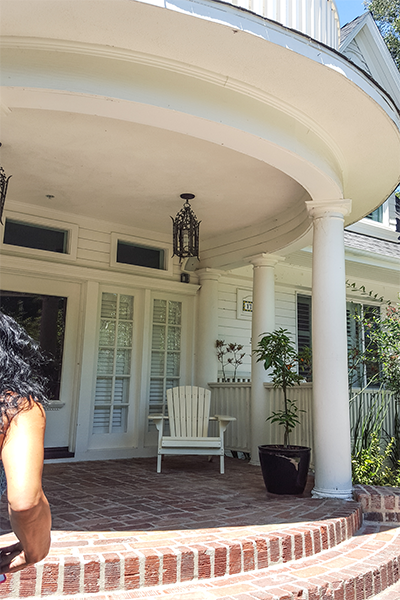 The 7,000 square foot Victorian-style farmhouse was built in 1904 and it’s tucked away from the hustle and bustle of nearby Hollywood. If you want to house your whole family for the weekend, in a huge home equipped with state-of-the-art kitchens and cute patios, then definitely add this place to your wedding venue checklist. 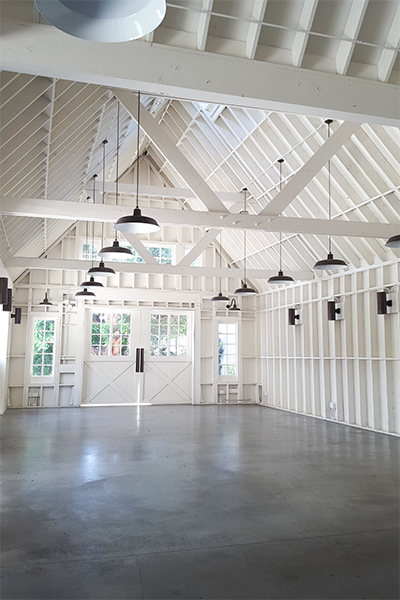 The white barn is a great space to hold your ceremony because, really, how many wedding barns are actually located in the heart of Los Angeles? Not many. Site fees start at $4,500 for 6 hours (Monday-Wednesday) or $5,500 (Thursday-Sunday) and they just added a $6,500 option for an 8-hour rental period. The epic Carondelet House was originally constructed as an Italian villa in 1928. 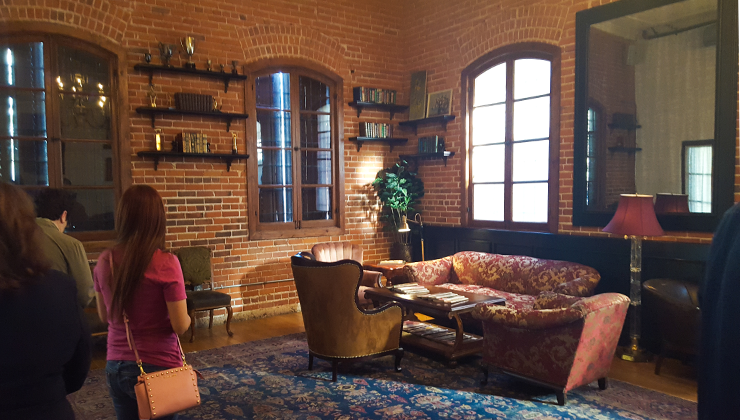 Once you cross inside past the red, exposed-brick exterior, it’s like entering into another time period. This place really knows how to woo the bride-to-be. My fiancé and I attended an open house and were really wowed by the interior furnishings and details. Even the bartender was serving our champagne in adorable coupe glasses and he was dressed the part with a vintage bowtie and suspenders. 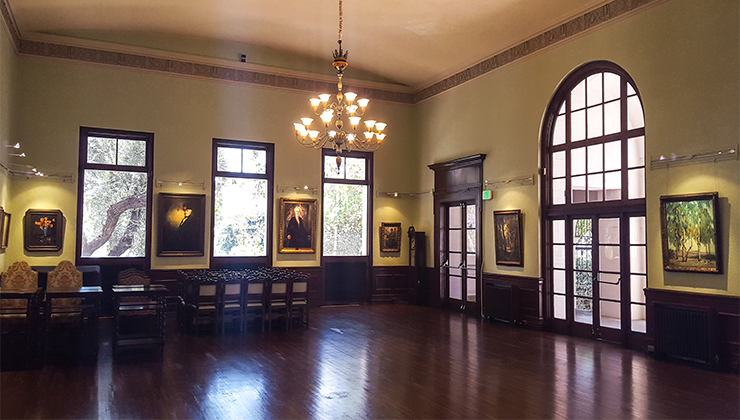 The Carondelet House is very spacious with three big main rooms adorned with old oil paintings, chandeliers and antique furniture. It also has 2 patios and an adorable sitting room (perfect hangout for groomsman) with a burning fireplace. 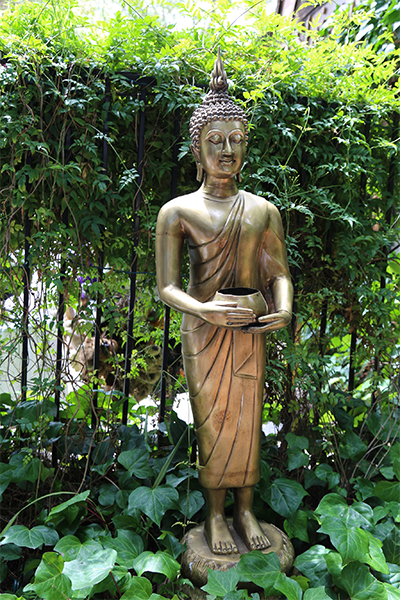 I mean, this place is ready-set-go for a wedding – just bring the flowers! However, if you are on a budget, the Carondelet House will probably be near the bottom of the list becuase it's a tad on the pricey side. For a 100 person wedding, be prepared to spend about $20,000 and that’s just for a Sunday wedding. With the slightly high catering costs (the food I tried was pretty great), a Saturday wedding will start at around $22,500. The Huron Substation was built in 1906 and it’s been the behind the scenes star of many Hollywood films including Must Love Dogs, Secretary and Fast and the Furious. About five to ten minutes outside of Downtown Los Angeles, this unique venue’s entrance actually contains a mini chicken coupe trailer with a live chicken living inside –random, I know. Past the coupe, you’ll enter a two-story building meant for the reception area, and in back there’s a patio with an Art Deco fountain for the ceremony. The site fee for the Huron Substation is $6,000, with a $250 cleaning fee and be prepared to pay for valet parking. We actually really liked the space when we visited it, but the jarring chain-link fence covering the entirety of the building made us think twice. 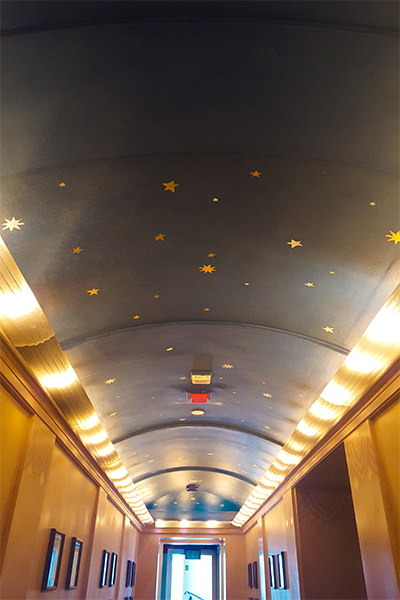 My fiancé loved this place…right when he found out that they shot the bank vault scene from Spiderman 2 (the Toby McGuire one) here. Yes, this place has actual bank vault in it, but sorry folks, it’s not operational or able to be opened. 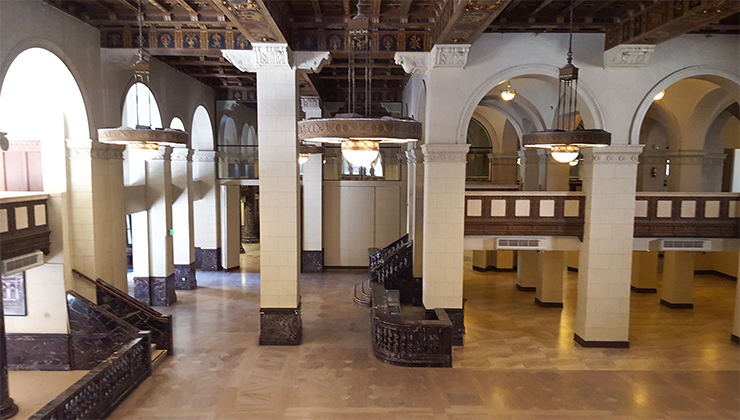 The Majestic, located in Downtown Los Angeles, definitely has an architectural wow factor - it's earned it's name. 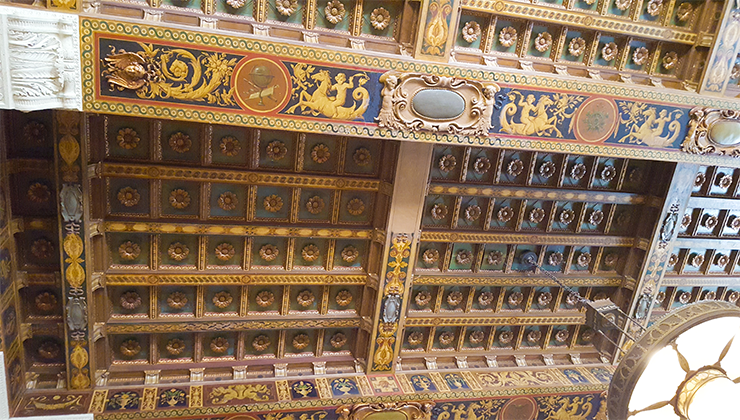 The ceilings are 32 feet high and painted with ornate and Italian details. I would recommend the venue for a wedding with a minimum 100+ guests (more like 150-200); otherwise the venue itself would seem a little too overwhelming in size. The in-house catering and bar service starts at $115 per person, which includes the venue fee, but there are spending minimums required so be sure to ask about them for a more accurate price quote. We actually stumbled upon Café Pinot by accident. 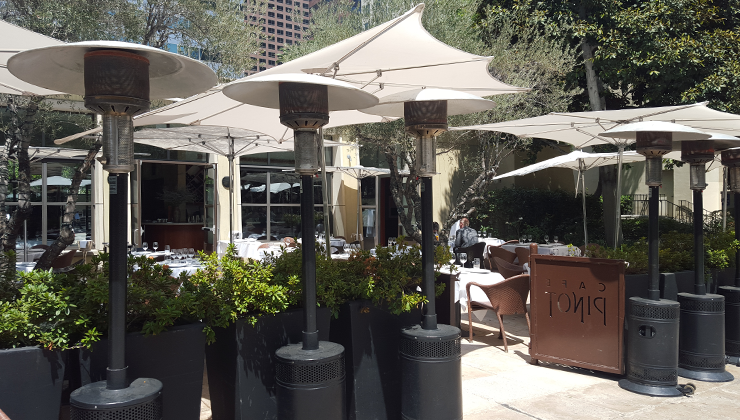 When I originally looked up the Downtown Los Angeles wedding spot, Café Pinot (Patina Group) first appeared over our budget so we didn’t give it another look. 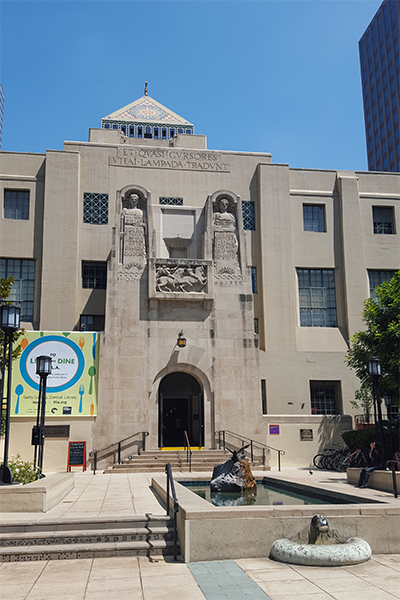 That all changed after we left our Oviatt Penthouse appointment and stumble upon the beautiful steps of Downtown LA's 1920's landmark public library. 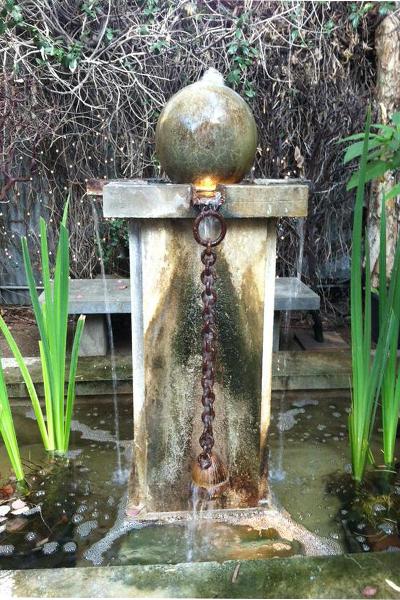 We stopped to admire the fountain outside, and low and behold to our left was Café Pinot. The entire space is unique, especially if you and your fiancé are avid readers (a library - oh, the possibilies!). 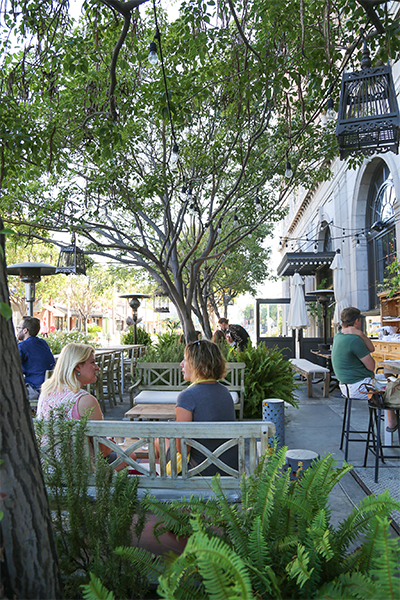 The Café has indoor and outdoor seating and at night, guests would be able to enjoy the lights of the sky and the DTLA skyscrapers. It’s maybe not one of the most affordable options out there, but because it’s soooo cool, I had to throw it in the mix. 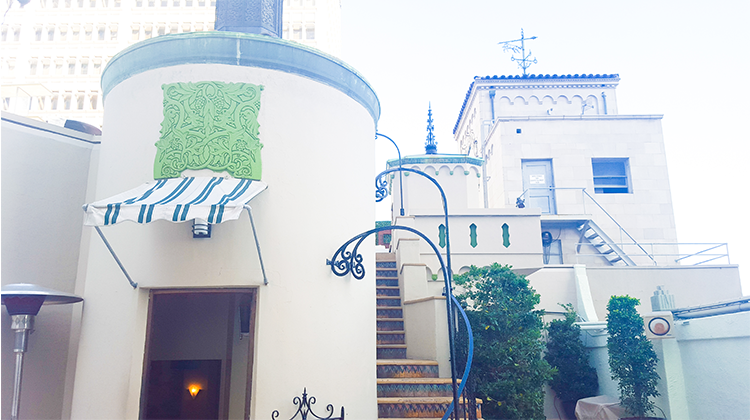 Cicada, housed in the same building as the Oviatt Penthouse, but at the bottom, is the epitome of Art Deco glam. 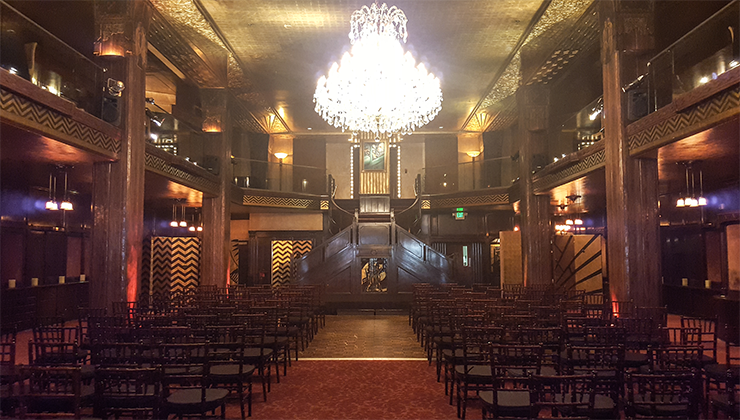 The 1920s wedding space is 15,000 square feet and converts to the Cicada Club on select nights for dinner and live jazz. 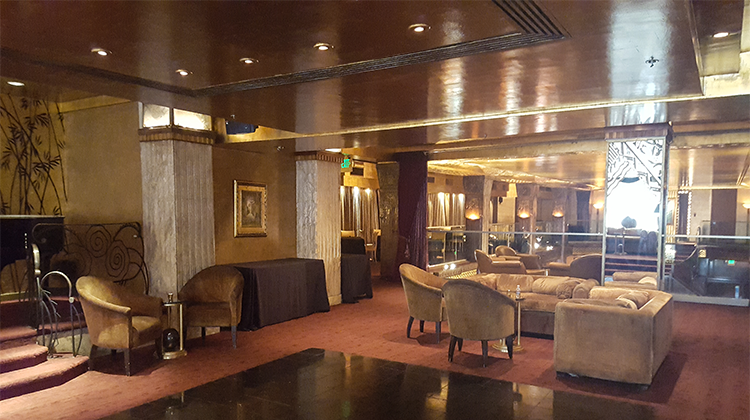 I could also describe slightly darker venue as “swanky” with its gold details, upstairs lounge and an accompanying grand piano. The who’s who of Hollywood must have had some wild times here – or at least that’s the vibe the space gives off. A wedding on a Saturday night is a $20,000 buyout minimum, but according to the manager, who’s been in charge of weddings there for a while, you could probably get a Sunday wedding for around $16,500-17,500 “out the door.” When my fiancé and I first saw the venue, we were floored by it’s grandiose setting and décor but got bummed we never a got a story from the manager to go with our tour. Heck, I’m a details girl. Don't forget to also check out the video I made that includes most of these venues and subscribe to my YouTube channel for more deals, happy hours and fun wedding stuff!